Eating Asian America: A Food Studies Reader, edited by Robert Ji-Song Ku, Martin F. Manalansan, and Anita Mannur, is available at Amazon, Barnes and Noble, and BooksAMillion. Chop suey. Sushi. Curry. Adobo. Kimchi. The deep associations Asians in the United States have with food have become ingrained in the American popular imagination. So much so that contentious notions of ethnic authenticity and authority are marked by and argued around images and ideas of food. Eating Asian America: A Food Studies Reader collects burgeoning new scholarship in Asian American Studies that centers the study of foodways and culinary practices in our understanding of the racialized underpinnings of Asian Americanness. It does so by bringing together twenty scholars from across the disciplinary spectrum to inaugurate a new turn in food studies: the refusal to yield to a superficial multiculturalism that naively celebrates difference and reconciliation through the pleasures of food and eating. 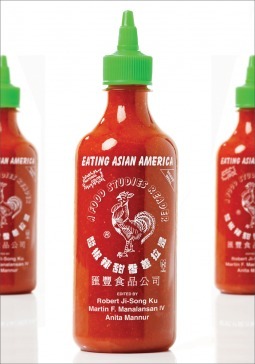 By focusing on multi-sited struggles across various spaces and times, the contributors to this anthology bring into focus the potent forces of class, racial, ethnic, sexual and gender inequalities that pervade and persist in the production of Asian American culinary and alimentary practices, ideas, and images. This is the first collection to consider the fraught itineraries of Asian American immigrant histories and how they are inscribed in the production and dissemination of ideas about Asian American foodways. Robert Ji-Song Ku is Associate Professor of Asian and Asian American Studies at Binghamton University. He is the author of Dubious Gastronomy: The Cultural Politics of Eating Asian in the USA. Martin F. Manalansan IV is Associate Professor of Anthropology and Asian American Studies at the University of Illinois, Urbana-Champaign. He is the author of Global Divas: Filipino Gay Men in the Diaspora. An academic work focusing on the influence of Asian-American cuisine. I admit, the book couldn't keep my attention for long periods of time, but there are some points of interest regarding Asian-immigration as traced through the evolution of food. I enjoyed the essay on School Lunch in Hawaii, mostly because recipes are included. I wish more recipes were scattered throughout the text; it would have helped me be more involved with the text. The history featured throughout the book is fascinating and well-researched. The problem is that it makes for dry reading - I found this read best in several short reading sessions focusing on one chapter at a time.